CLEVELAND — On Tuesday, December 12, the girls basketball teams from Crestline and Bucyrus were able to enjoy an experience that most could only dream about. The two squads loaded up the buses and traveled to Cleveland to play an afternoon game at the Quicken Loans Arena, the home of the Cleveland Cavaliers. Crestline would be the home team with Bucyrus playing the role of the visitors on this trip north. When the clock reached all zeroes, it was the visiting Lady Red coming out victorious over Crestline by a final score of 52-24. The Lady ‘Dogs drop to 0-5 overall with the defeat and remain at 0-1 within the Mid-Buckeye Conference. Bucyrus improves their season record to 4-0 and sit at 1-0 in the Northern-10 Athletic Conference. Lauryn Tadda was the leading scorer on the afternoon for the Bulldogs, earning nine points to go with five rebounds and three steals. Kennedy Moore finished with six points and two rebounds for the home team on Tuesday. Alandra Tesso, Hannah Delong and Daija Sewell all chipped in three points apiece to round out the offensive output from the Lady Bulldogs. Other Crestline stats for the day were: Team- 9/27 from the interior, 1/9 from the perimeter, 3/7 from the free-throw line, 35 rebounds (8O, 27D), 9 blocks, 9 assists, 6 steals and 39 turnovers; Tesso- 3 rebounds, 1 steal; Delong- 2 rebounds, 1 block; Sewell- 4 rebounds, 2 blocks, 1 assist; Lydia Tadda- 5 rebounds, 1 block, 5 assists, 1 steal; Bri Briggs- 4 rebounds, 1 block, 2 assists; Destiny Hoskinson- 1 rebound, 1 assist; Kirah Hoskinson- 5 rebounds, 1 block; Ivy Stewart- 1 rebound, 3 blocks, 1 steal; Brynn Cheney- 2 rebounds and Jeri-ka Cassidy- 1 rebound. The Crestline Lady Bulldogs look to bounce back on Saturday, December 16 when they play host to the visiting Loudonville Lady Redbirds in MBC play. 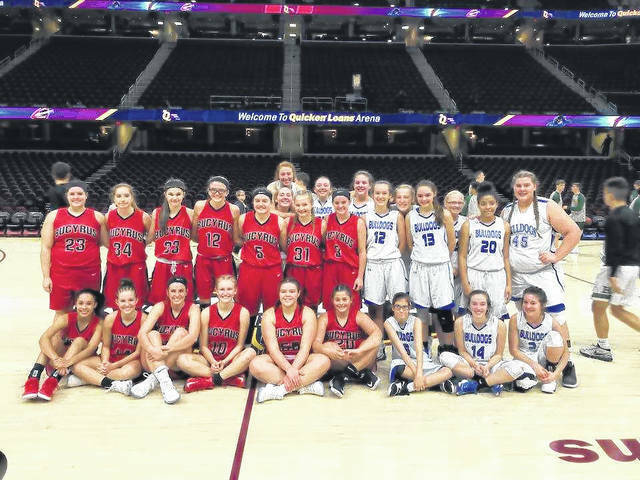 Photo courtesy of Matt Wade, Athletic Director at Crestline The Bucyrus Lady Red and the Crestline Lady Bulldogs played their contest at the Quicken Loans Arena on Tuesday. Bucyrus came away with the 52-24 victory to send Crestline to an 0-5 start to their season. https://www.galioninquirer.com/wp-content/uploads/sites/38/2017/12/web1_GBK-vs-Bucyrus-at-the-Q.jpgPhoto courtesy of Matt Wade, Athletic Director at Crestline The Bucyrus Lady Red and the Crestline Lady Bulldogs played their contest at the Quicken Loans Arena on Tuesday. Bucyrus came away with the 52-24 victory to send Crestline to an 0-5 start to their season.